What is a non-standard luminous shape? The IES LM-63 and EULUMDAT file formats have fields for defining the luminous shape of a luminaire. These descriptions are limited to simple shapes like flat rectangles, circles or square, or 3d shapes like boxes, cubes, cylinders or spheres. Shapes like open rings, serpentine lines, or spirals cannot be described within these file formats, so some approximation is often used. What happens when you use a standard shape? 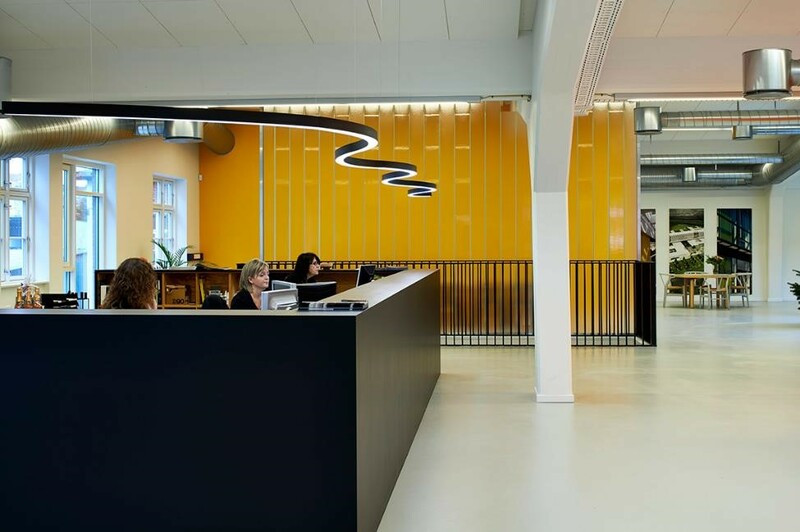 In software like AGI32, Visual and Dialux, the luminous shape is used for 2 parts of the calculation, the initial emission of light and the shadowing of light that comes back into contact with the luminaire. The luminous shape is also used for the rendering of the room. For this paper, we looked at a 10' ring luminaire, similar to the photo above, but with only indirect light. The ring itself was narrow compared to the diameter, so there is a large open region in the center. 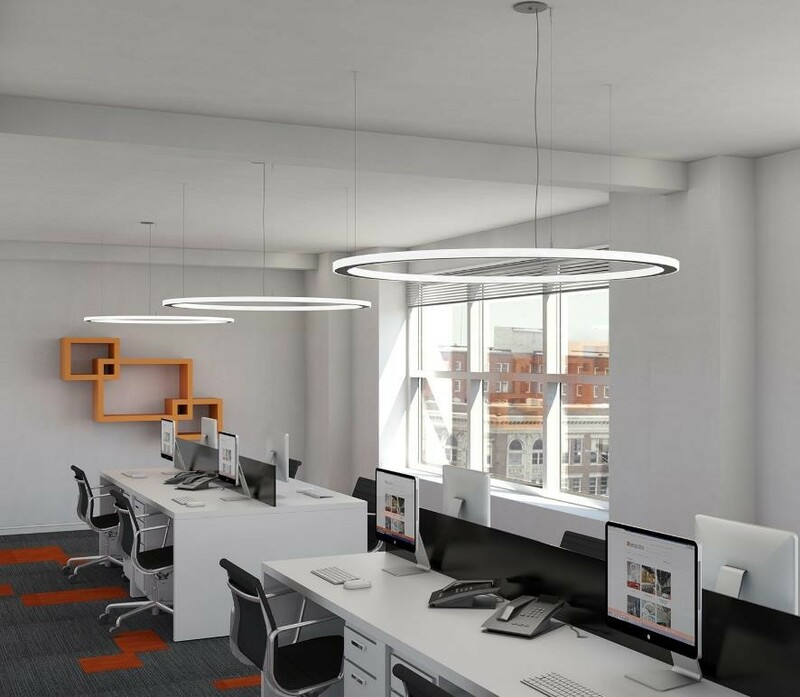 Without taking special care, many IES files for a fixture like this will have the luminous shape set to a cylinder or circle of 10' diameter with the light emitting out of the top. Since there is no way to describe the center of the ring as being open, light is emitted from the entire circle, which results in a large region of light on the ceiling which is actually brightest in the center (lower right image). In reality, light is emitted from the perimeter of the ring and thus creates a ring of light on the ceiling, which can be shown in a Photopia simulation of the actual ring geometry (upper right image). Photopia simulation with a dark area in the center. AGI32 using a luminous cylinder. In addition to the difference in the rendering of the light on the ceiling being a ring versus a single region, there can be consequences in the computed light level on the workplane for geometry like this. 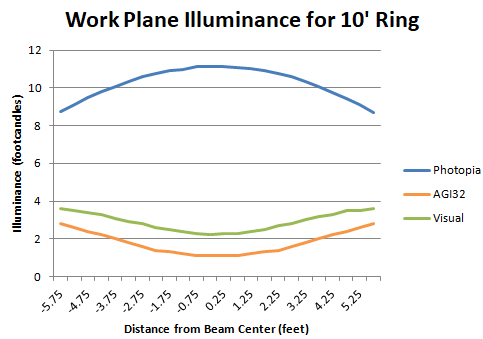 For an application of this 10' ring luminaire in a space, we computed the workplane illuminance using the full model in Photopia, and using the standard geometry options in AGI32 and Visual. Photopia shows significantly higher light levels, which is due to the fact that the large 10' luminaire in AGI32 and Visual blocks light from the ceiling reflecting back down to the floor. In Photopia the center of the ring is open, resulting in more inter-reflected light. Workplane Illuminance using Standard Shapes. Instead of using a single IES file for the entire 10' fixture, the best approach is to break down the fixture into short sections that can be assembled in AGI32 or Visual to create a true ring shape with an open center. In this example we made an IES file for a 1' section and then used that to build up the ring. This results in both a much more accurate light pattern on the ceiling, showing the true dark region in the center (upper right image), and a much better prediction of light levels on the workplane since light can pass through the ring center to the floor (lower right image). This is also the approach that a lab takes for a fixture this size. Most labs cannot directly gonio-photometer a 10' diameter fixture, so they will instead do a small section. 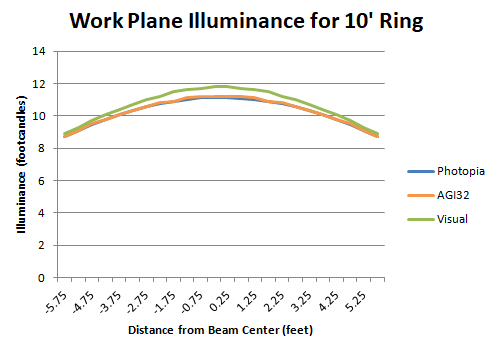 Workplane Illuminance using section approach. LTI worked with Lighting Analysis (AGI32), Acuity Brands (Visual) and ITL to review the process and comparison between methods and is thankful for their assistance in confirming the behavior of their application software. Screenshots from Photopia and AGI32 were created by LTI Optics. Luminaire images are courtesy of their manufacturers and used with permission. Images were retrieved October 2018.